Choose the image below that looks like the titles in your library's collection. If you're no longer interested in a title that you have on hold, follow the steps below to remove your hold. 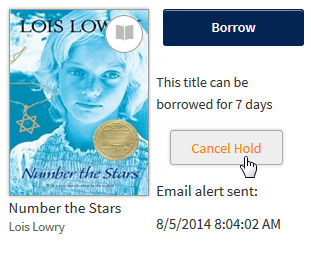 In your library's digital collection, click or tap , then select Holds. You'll need to be signed into your library to get to this page. Select Remove under the title you no longer want. If you don't see the title on your Holds page, it may have been automatically checked out to you. In this case, you can return the title from your Loans page (under ). 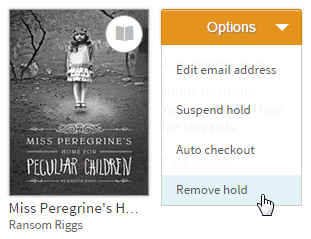 Before you receive an email telling you that your hold is available, go to your Holds under your library Account, then choose Remove hold from the Options drop-down menu next to the title. 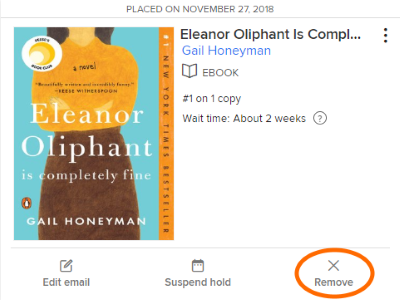 Or, if your hold is available but has not been automatically borrowed for you, go to your Holds under your library Account, then choose Cancel Hold next to the title you no longer want to borrow.